Smart Industry: Changing mindsets about data use is critical. Why? Trent: Data can be one of an organization's most valuable assets, but only if and when that organization understands how to extract the value from it. Data without analysis can provide no insights and, as such, is useless. Transforming into a data-driven organization requires that everyone understands how to appropriately utilize data, but perhaps more importantly, that they understand why it is valuable to do so. By demonstrating how data can be used to uncover information or discover knowledge that was once hidden and then relating that back to organizational goals, team members are able to recognize how their efforts are a part of something much larger and how their efforts drive overall performance. Smart Industry: Why is knowledge-sharing within an enterprise critical in this era of digital transformation? Trent: Knowledge drives human ingenuity, which is the impetus for change. As knowledge is shared across an organization and individuals learn how to examine situations from differing perspectives, they are then better able to discover creative solutions. As we usher in this 4th Industrial Revolution we will continue to face challenges that we don’t even know exist yet; the organizations that are most prepared with creative solutions to those challenges stand to emerge as winners. Smart Industry: Describe the Internet of Things Talent Consortium? Trent: At our core the IoTTC is a community of human-capital experts and practitioners who work across industry, academia and government to drive IoT-enabled digital transformation for the betterment of business, society and the world. We provide leading organizations with access to real-world insights on talent and the future of work based on primary and secondary research, support and best practices from lessons learned. As executive director I represent our member organizations and lead the Consortium's efforts in producing thought leadership on the implications of digital transformation and the workforce of the future. We have seen dramatic changes around talent in the last few years and anticipate that we will continue to see it in the years to come, albeit at a much faster pace. Organizations are beginning to realize that the digital revolution will not be driven by technology, but by people, and that success will require a new type of talent within those organizations. The jobs of the future will increasingly require strong communication, project management, critical thinking, and complex problem-solving skills embedded in a culture supportive of innovation and continuous learning. 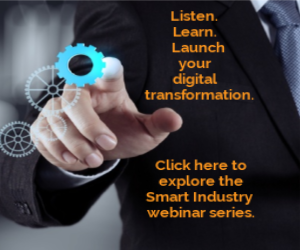 Smart Industry: What most excites you about this age of information abundance? Trent: The sheer amount of information available to us is greater now than at any other point in history. As this continues to grow I am most excited about the possibilities to tackle problems that were once thought of as truly impossible. Through smart-city initiatives we are decreasing traffic congestion and, therefore, reducing greenhouse-gas emissions to help limit damage to our environment. We are able to monitor jet-engine performance in real time to predict possible defects and thus improve the safety for all passengers. We can utilize data to glean insights into human-health issues and increase the quality of life across the globe. The most exciting part is that we are just getting started. The most forward-looking organizations, like those who are members of the IoTTC, will drive these efforts and I’m honored to be able to bring all of those organizations together to help them accomplish that.